The Ethiopian Wolf Conservation Programme protects these rare and special wolves in all six highland enclaves where they live, from the Bale Mountains in the South to the majestic Simien Mountains in the North. Simien is home to the second largest wolf population. There, our Team Leader Getachew works with Monitors Andualem and Jejaw and Wolf Ambassadors Mebrat and Melkamu to safeguard these wolves and mitigate conflicts with local shepherds and increasing tourism. 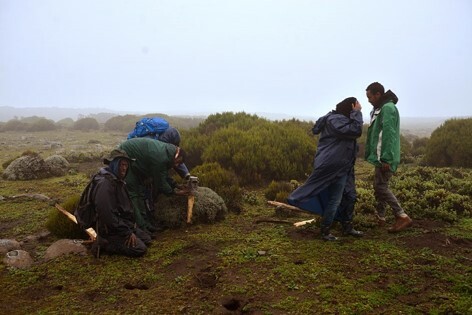 We need your help to continue our work in Simien and build a field camp to provide shelter from the harsh highland weather. Donate to EWCP on November 27th, #GivingTuesday, and one of our most generous donors will match every donation up to $7,500! You can make your donation to the wolves count. All proceedings will go to support our activities in Simien. EWCP is a WildCRU, Oxford University, endeavour in partnership with the Ethiopian Wildlife Conservation Authority and Regional Governments. Chief­ly funded by Born Free Foundation and the Wildlife Conservation Network. Under the aegis of IUCN SCC Canid Specialist Group. 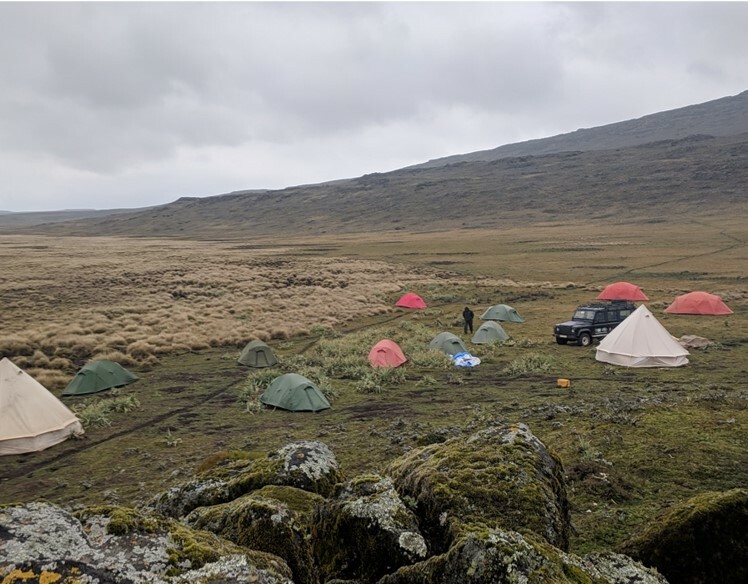 A note as I re-emerge from 10 days in the Bale Mountains, supporting our team in the remote Chafadalacha swamps on the edge of the Sanetti Plateau. We camped at nearly 13,000 feet (a small settlement of 20 people and 17 tents). We workedroudn the clock to capture Ethiopian wolves, the final step in a pilot of a vaccine for Canine Distemper Virus (CDV). Our aim was to trap wolves that had been vaccinated a few months earlier, in order to measure their immunological response. The blood samples will be tested in the UK in the coming weeks. If we prove that the vaccine deliveres protetcion against CDV, then we will be ready to respond to future emergencies. CDV epizootics have been responsible for many wolf deaths in the past 10 years. The weather was harsh, and the work challenging, but the dedication and high spirits of my team never cease to amaze me. After many years of research, field trials, and awareness work, EWCP is now vaccinating Ethiopian wolves as a preventive measure against recurrent rabies outbreaks. With no more than 500 Ethiopian wolves left in the world in half a dozen populations, all exposed to domestic dogs that carry deadly diseases, it is paramount/essential? to stop them from getting infected. After successfully testing Virbac’s SAG2, an oral vaccine widely used to eradicate rabies in Europe , we can now protect the wolves without the need of manipulation and thus deliver protection before outbreaks happen. 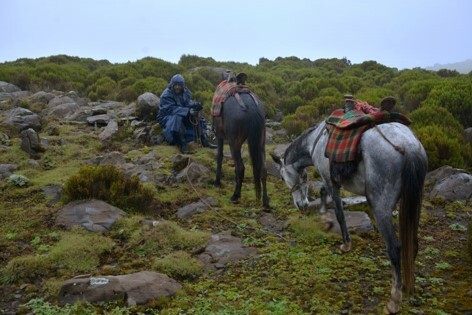 The first five wolf families vaccinated using meat baits live in the Bale Mountains, where our dedicated team worked in the most remote corners of these vast mountains under persistent rain this past month. We are now rejoicing for achieving such a milestone. This achievement is result of the combined efforts of many, from wolf monitors to researchers, and specially the loyalty of our generous donors the Born Free Foundation, the Wildlife Conservation Network and many others. This turning point in our battle to tackle rabies is of special significance to us, as we recall when 30 years ago an outbreak of rabies killed many of the wolves that Claudio Sillero (EWCP Founder) followed closely for his doctoral studies and the many obstacles that our programme has faced in our battle against diseases since. The SAG2 vaccine, successfully used to eradicate rabies from wild carnivore populations in Europe, now raises hopes for the survival of one of the rarest and most specialized carnivore in the world. Over the next three years, we will expand the vaccination campaign to all six extant wolf populations, enhancing their chances of survival in a changing world. We distribute vaccine sachets contained within a meat bait within the territory of a known wolf pack. We do this at night, and deploy camera traps (automatic cameras) close to each bait to who is consuming the vaccine and when. In the first three packs covered, we recorded a very good uptake, with 88% of 119 baits consumed by wolves over two nights. In a few weeks' time, we will come back to the same area to capture wolves and measure their immune response. This intervention will provide additional evidence the effectiveness of the vaccine, already testes in extended field trials. News from the field - Better project management for EWCP! When I joined EWCP 20 years ago our small team would meet almost every day, either in our cosy wooden cabin in the forest (still our base), or in the Web Valley or the Sanetti Plateau camps. We were a small tem working mostly in one mountain range. Today, it takes various flights, long hours on the road, and much organization, to gather the full team in one place. We managed just that last week, when all senior staff gathered in Dinsho for a special occasion - and we were indeed stuck there for 10 days, as a stay-at-home general strike meant that no shops were open, there was not a single car on the road, and communications were scant or non-existent. But we kept our spirits up and once the strike ended we crammed a busy schedule into the remaining 7 days and got on with it. The key reason why we all gathered in Dinsho started a year ago, when with Claudio and Joyce we conducted a health check of the Ethiopian Wolf Conservation Programme, using a clever tool developed by WCN to assess our current institutional health, and suggests improvements. With an expanding team, new sites, and growing operational and political challenges, it was not surprising that we identified shortcomings with project management. We sought professional help, and, to cut a long story short, here we are with Beth and Alison from WildTeam UK, learning about Project Management for Wildlife Conservation, a tool developed by this charity. Last October Claudio, Eric and I had taken the PMWC course, and took our exams with trepidation, bringing back memories of our student days. We worked together to tailor the WildTeam “trackers” to fit EWCP needs. These are documents that will help us to track everything from equipment and contacts, to work plans, risks and lessons. The theory and practice delivered by WildTeam is helping our team beyond expectations. I am fascinated at witnessing the attention and commitment that everyone showed during the course and taking their exams. I am already hearing conversations among EWCP staff talking about control processes, roles, risks and issues, and lessons learnt! We anticipate a positive impact in the way we work, and this is largely thanks to the support of WCN and our donors. Thank you. As I drove with Eric towards Addis Ababa this morning, we talked about this great experience and how the ‘medicine’ appears to be working. Where we saw problems before, we now see opportunities and new ways to do our work. And the best part is that it is not only us, but the entire team, who is feeling this way. PS: On the way we stopped in the Arsi Mountains and climbed up to the amazing Bora Luku peak, at 3,700m. We found an active den and two alert wolves, a bit nervous of our presence so close to their pups. This fleeting sighting of rare Arsi wolves made us all happy, because it reminded us of why we do this and why effective project management matters. This is the time of the year when we look back, take stock, and project into the future; when we feel grateful for the good things that took place and commit to new ones. As 2017 comes to an end, we bring you a message of hope. This was a year when many wolf packs bred profusely, bringing the assurance of new life; team members completed their degrees, becoming the strong leaders that conservation needs; and years of research and field tests culminated, with the innovation of oral rabies vaccines to save many wolves from a dreadful death. This encouraging end-of-year balance was possible thanks to many generous supporters, who made it possible that our teams get the job done. Looking ahead, we will build on the achievements of 2017 and aspire to ensure that all wolf packs breed every year, that our teams grow in confidence and expertise, and that no more wolves die from disease. Help us keep alive the dream of a better future for Ethiopian wolves by supporting EWCP. With best wishes for 2018, the EWCP Team. $50 buys waterproof jackets and trousers – it rains pretty solidly for 8 months of the year and our teams are in the field no matter what the weather! Keep alive the hope for the survival of Ethiopian wolves: become a supporter and help us protect the rare Ethiopian wolf. There are only 500 Ethiopian wolves in the world and all live in the highlands of Ethiopia. Right now, new born litters leave their dens for the first time at 4,000 meters in the Sanetti Plateau. These pups renew our optimism. This #GivingTuesday give HOPE to Ethiopian wolves: support the Ethiopian Wolf Conservation Programme. 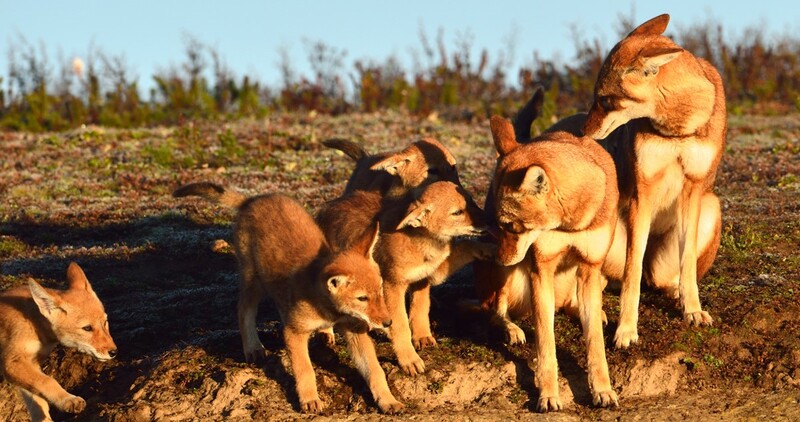 New life – We follow and protect many wolf families in the Bale Mountains. Last year we witnessed record numbers of pups, bringing hope for recovery after a devastating disease outbreak in 2016. Innovation –We are ready to use oral vaccines to stop rabies from infecting Ethiopian wolves in the first place. Strong leaders – We nurture key EWCP staff to become the conservationists of the future. $50 buys waterproof jackets and overtrousers – it rains pretty solidly for 8 months of the year and our teams are in the field no matter what the weather! 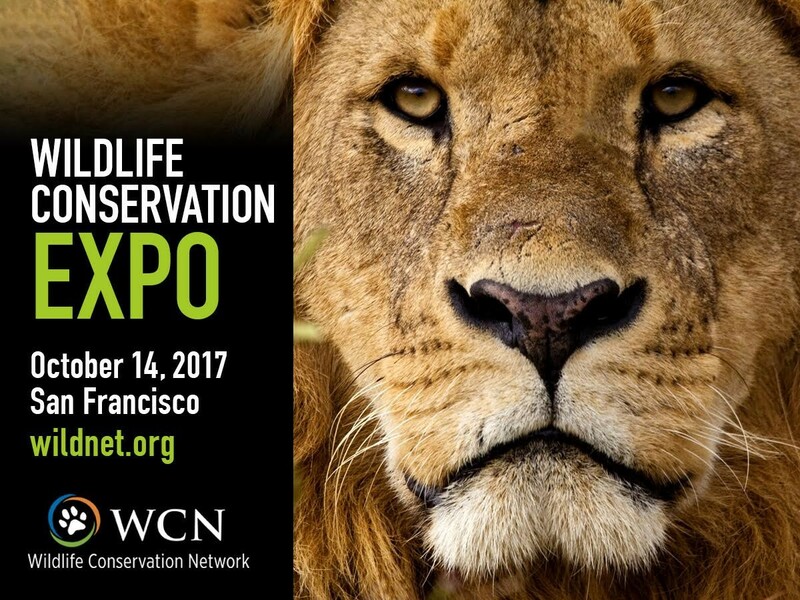 On 14th October I will be in California attending the 2017 Wildlife Conservation Expo at the Misison Bay Centre in San Francisco. It is hard to believe that the Wildlife Conservation Network started its good work 15 years ago. 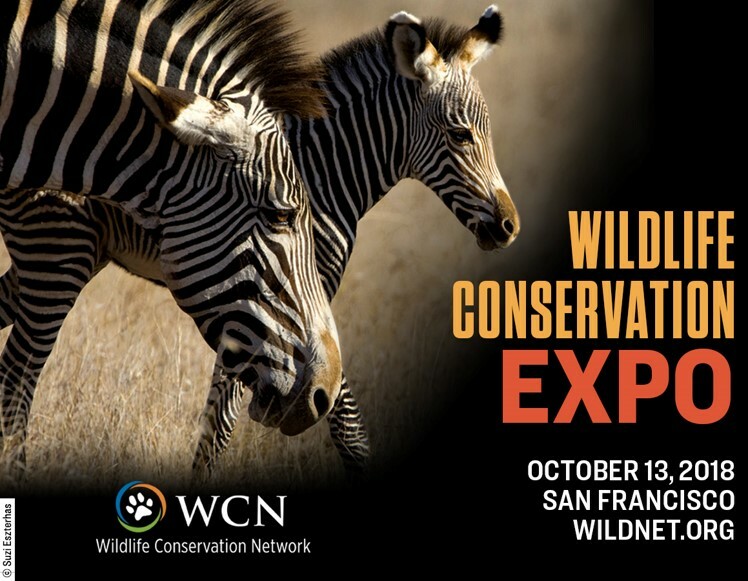 The Expo has become one of the key dates in the wildlife conservation calendar, and WCN an important player in conservation funding supporting a growing number of dedicated conservationists. We are very fortunate to be part of the WCN family from the very start. To date WCN supporters have raised over US$1,500,000 for Ethiopian wolves and I want to extend our gratitude to them and urge them to continue to support our work. The eventful lives of wolf packs: news are good! Our Wolf Monitors work tirelessly, following wolf packs day after day, tracking every event in the life of these close-knit families. 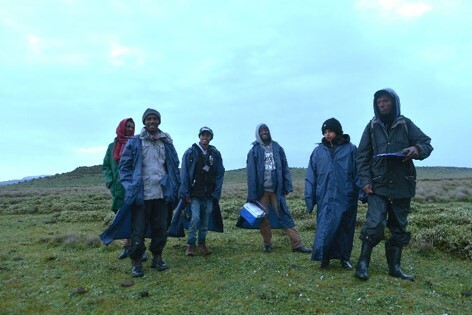 In the Bale Mountains a team of eight monitors, under the experienced leadership of Alo Hussein, track over 20 focal packs, some known to us for up to 30 years (the BBC pack has been monitored since 1987). After the devastating epizootic of canine distemper in 2016, the Monitors were keeping a close eye on the most seriously affected families. To their delight, this turned up to be an exceptionally good breeding season. Pups were born to 80% of all the packs monitored and, by January 2017, the monitors had counted over 60 pups. Good breeding will boost up the recovery of the Sanetti Plateau population, stricken by consecutive outbreaks since 2014. In the Web Valley, meanwhile, three large packs were splitting up, each originating an additional new social group. A prolific breeding season put a smile on the Wolf Monitors’ faces after a tough field season. We hope that these waves of optimism reach all EWCP partners and supporters, bringing the warm feeling of knowing that our efforts are not in vain. Thank you. We have the pleasure to announce that Girma, from the Ethiopian Wolf Conservation Programme, successfully defended his thesis at Leiden University on Tuesday 6th of September. 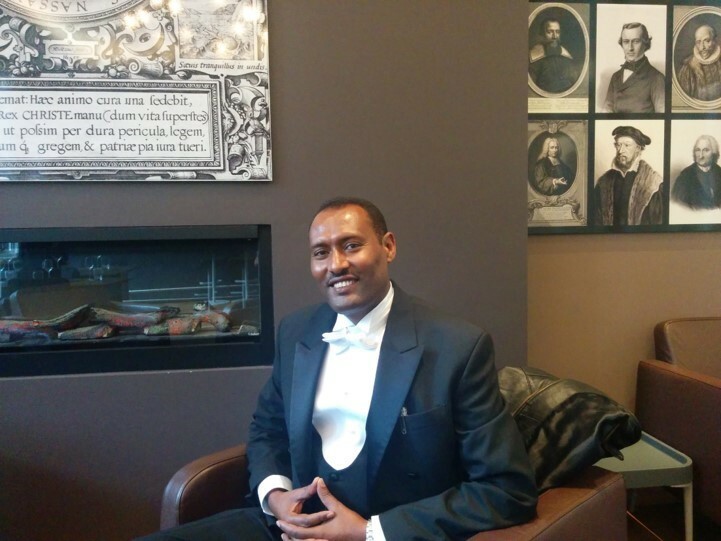 Girma’s research is part of an innovative collaboration between the prestigious Dutch university and the WildCRU. In his thesis he studies the ecology of Ethiopian wolves, assesses conflicts with people living alongside them, and suggests solutions. 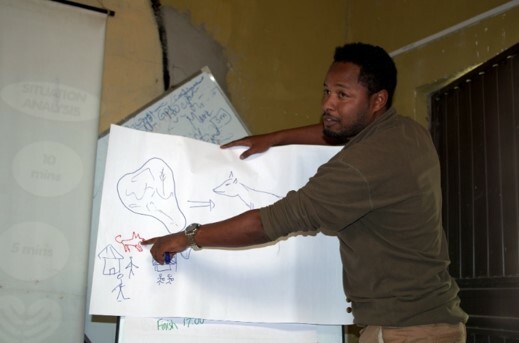 Girma is now our Project Leader in the Borena Sayint National Park, applying his knowledge and skills to help protect the natural resources on which many endemic wildlife, and millions of Ethiopians, depends on. Five years after its creation, a mid-term review was carried out to determine the level of implementation and success of the National Action Plan for the conservation of Ethiopian wolves , and to adapt objectives and actions for the next five years. The review involved an external consultant and a meeting with key stakeholders in Adama in July 2017. The independent assessment revealed significant progress with NAP implementation, with 25% of NAP actions achieved and 46% ongoing or starting, but with no advancement on 21% of the actions listed as high priority in 2011. Extensive consultations indicated ample support for NAP but with diverse levels of commitment by different stakeholders. There was a general agreement on the need for a coordinating body to improve communication amongst stakeholders. During the stakeholders meeting the external assessment was presented and the plan was revised and discussed, action by action. This revised NAP reflects up-to-date timelines and actors, and prioritizes innovative lines of work such as an integrated disease management plan with the use of oral vaccines to minimise the threat of rabies and enforcement of regulations to control domestic dogs in and around protected areas. Participants also explored the value of conservation translocations of Ethiopian wolves to rescue declining populations or to create new ones where wolves are now extinct. Monitoring and research, capacity building and habitat protection remain at the heart of the strategy to save Ethiopian wolves from extinction, together with education and awareness in support of conservation and to understand the wider benefits of protecting the biodiversity and functions of Afroalpine ecosystems in Ethiopia. Look at this beautiful document here, or read the summary. 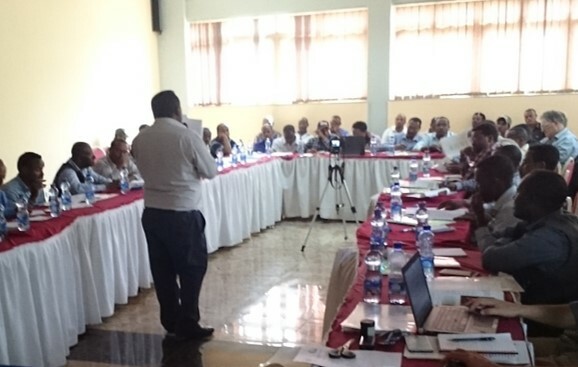 2016 was marked by widespread unrest in Ethiopia affecting several EWCP sites, culminating with the declaration of a state of emergency in September. In spite of the many logistic and administrative complications that ensued, most of our activities were implemented in full and with positive results. Thanks to the hard work of our Wolf Monitors we can report that wolves in Bale Mountains are on their way to recovery from recent rabies and distemper epizootics, with a 30% growth. Many pups were born, and we are confident this will translate to successful recruitment into the population. Our monitoring teams continue to expand, with more Wolf Monitors and Wolf Ambassadors recruited across the Ethiopian highlands. 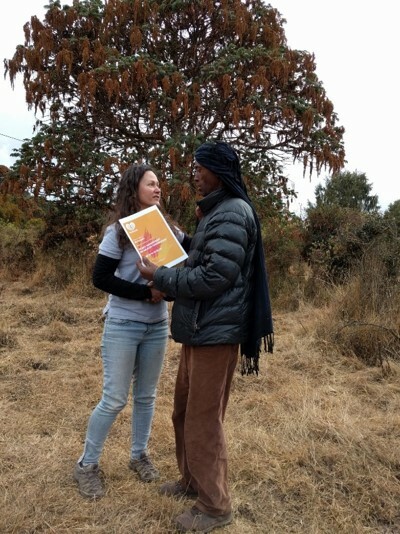 To ensure that threats to wolves are detected and reported efficiently, we are providing training to staff in the Arsi, South Wollo and Simien mountains. We have also trained veterinarians from local government agencies. As epitomised by recent disease outbreaks in Delanta (the smallest wolf population), where we now find only 2 or 3 survivors, disease remains our major concern. In Bale we vaccinated over 3,300 domestic dogs in and around the National Park to prevent disease transmission, and are focusing our energy on an integrated disease management approach that will involve many actors and political support at various levels. Implementing preventive vaccination of Ethiopian wolves (rather than responding to an epizootic) remains a key objective. We also took the first steps towards promoting conservation translocations as a necessary complementary approach to ensure that no more wolf populations become extinct. Central to our work is raising awareness for the need to protect the wolves and the Afroalpine ecosystem across Ethiopia. We worked with 35 schools and many local communities, developing and distributing information materials and holding special events (such as Wolf Day and World Rabies Day), and promoting more sustainable use of natural resources to prevent further habitat degradation. We remain highly committed to building the capacity of protected area staff, our own staff and that of partner organizations, through practical training, scholarships and supervision for Master and PhD students, and supporting research projects on the most pressing issues for wolf conservation. We are grateful to all our supporters for making implementation of our core activities possible and to develop new ones. We are delighted to be able to bring to you so many good news. As the key pressures upon the wolves are not diminishing, your help is needed as much as ever. A wolf family lost in a sea of "guassa" tussocks in the Simien Mountains National Park. Thanking all our partners and supporters from around the world for helping EWCP help the last surviving Ethiopian wolves. 2016 was a difficult year for Ethiopian wolves in their stronghold in the Bale Mountains, with disease remaining their most serious threat. But we will start the New Year with renewed energy, having reently expanded our footprint to new Afroalpine areas, with a larger-than-ever team of passionate Ethiopian conservationists and the essential support of our partners in the Ethiopian government. Without your support Ethiopian wolves will soon dissapear, and the Roof of Africa will never be the same. Claudio & the EWCP team. 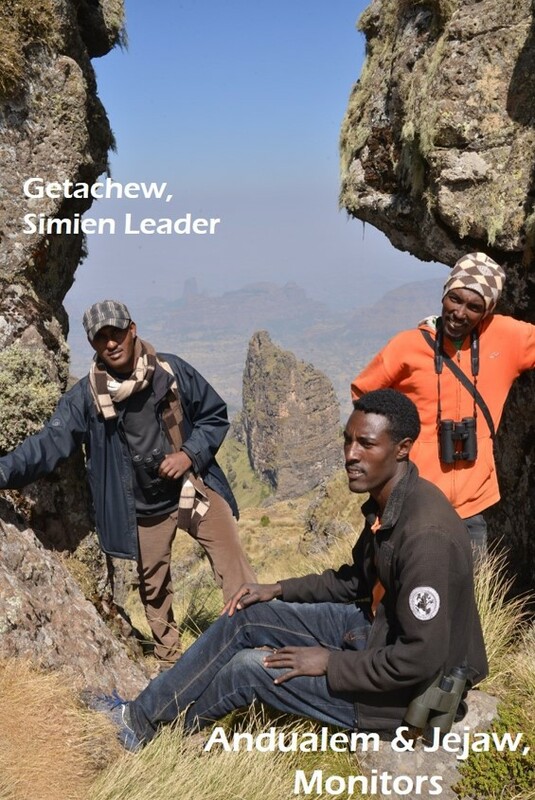 EWCP team in the Simien Mountains, December 2016. Copyright © 2016 A WildCRU endeavour in partnership with Ethiopian Wildlife Conservation Authority and Regional Governments. Chie­y funded by Born Free. Under the aegis of IUCN/SCC Canid Specialist Group. 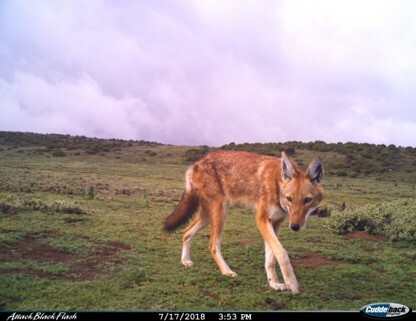 The news reached us swiftly thanks to EWCP’s early alert system, with the involvement of our local Wolf Ambassadors: several dead Ethiopian wolves had appeared in Delanta, a small Ethiopian wolf enclave in the Wollo Highlands. After a swiftly arranged field trip, and lab confirmation of rabies in some of the brain samples collected, an emergency response to vaccinate the few remaining wolves unleashed. As we speak, an EWCP team led by Eric Bedin is fighting to contain the disease. Over the past week they captured and vaccinated a young female wolf and one adult male. These two vaccinated wolves might hold the key for the persistence of the Delanta population. It is with mixed feelings that we report this news. We are proud of our readiness to monitor and react to threats, but also sad to witness how the accumulation of threats is bringing the Delanta wolves a few steps closer to extinction…. Recent losses of important wolf habitat had reduced the Delanta population to fewer than 15 wolves. We will keep you and the Ethiopian authorities informed of how the intervention pans out. Together we can bring about a sustainable solution for the long-term survival of wolves in the remote and beautiful Delanta range. Photos: Delanta campsite, team eating local yogurt, and a wolf running away after the vaccination (by E Bedin and F Lema). An important scientific paper has just been published in the Vaccine journal, reporting on the trials EWCP has been undertaking of an oral rabies vaccine in to protect Ethiopian wolves form rabies. With permission from our government partners we have tested bait preferences and the delivery of the vaccines in a few wolf packs in the Bale Mountains. This is the first trail of its kind. Never before the SAG2 rabies vaccine had been tested on wild populations of an endangered species, even though this same oral vaccine has helped to eradicate rabies in red foxes and raccoons over vast areas of USA and Europe. After this successful test, backed up by the international community via the peer review system, oral vaccination can turn our disease fighting strategy from being reactive, to being proactive. Why wait for the next outbreak to take hold when we can offer the last few hundred surviving Ethiopian wolves effective protection? We are working with our partners on an integrated disease management plan that would reduce the prevalence of dog related diseases, bringing benefits to wildlife, people and their livestock. Oral vaccination could spare many from a hideous and certain death and deliver a concrete financial benefit. Photos: Ethiopian wolves comsuming the oral vaccine and the team preparing the vaccine with gaot meat, the preffered bait. Research published this week in the journal Vaccine reports field trials of the oral vaccine SAG2 in Ethiopian wolves, Africa’s most threatened carnivore and the world’s rarest canid. The trials, undertaken by the Ethiopian Wolf Conservation Programme in the Bale Mountains of Ethiopia, are the first ever conducted in wild populations of an endangered carnivore. Researchers from Ethiopia and the UK tested various ways to deliver the SAG2 vaccine in three wolf packs. Of 21 wolves trapped after vaccinations, 14 were positive for a biomarker indicating that the animal had ingested the bait; of these, half showed antibody titres in blood above the universally recognised threshold, and 86% had levels considered sufficient to provide protective immunity to wildlife. Wolves were closely monitored after the vaccination, and all but one of the wolves vaccinated were alive 14 months later (higher than average survival). 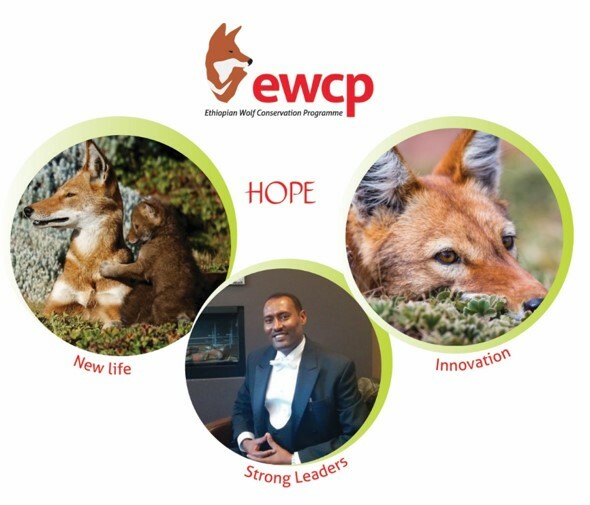 The EWCP has expanded on various fronts during the last 12 months, including new personnel, more Wolf Ambassadors, and site-specific projects addressing emergent conservation needs outside EWCP’s base in the Bale Mountains. The priority, however, was to sustain a strong presence in Bale, where we weathered one of the most devastating outbreaks of CDV among Ethiopian wolves. Thirty-four wolf carcasses were found between September 2015 and March 2015, and another 31 adult wolves were unaccounted for in 17 focal packs in the Web Valley, Sanetti Plateau and East Morabawa. On average these populations declined in size by 52%, with respect to the previous year. In a positive spin, at least 28 pups outlived the outbreak bringing hopes for a population recovery. Our fight against infectious diseases included the vaccination of over 5,000 domestic dogs, in and around Bale Mountains National Park; the successful completion of an oral wolf vaccination trial; and a pilot of a CDV vaccine for Ethiopian wolves. With our partners in the federal government, park authorities and NGOs we have drafted an integrated disease control plan which is pending approval. 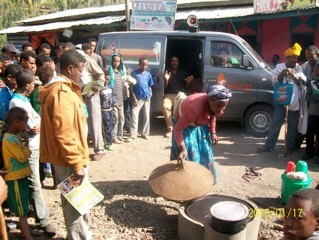 We are working closely with new protected areas in Arsi and South Wollo; we assessed the quality of Mt Choke as a potential reintroduction site; and worked with communities in North Ethiopia to create more sustainable and alternative livelihoods, compatible with Afroalpine conservation, such as helping establish local producers of fuel-saving stoves and honey. Our education programme reached 19 target schools across Ethiopia and many highland communities coexisting with the wolves. We are seeing the fruits of several small-scale conservation projects implemented by Nature Clubs with the support of EWCP. 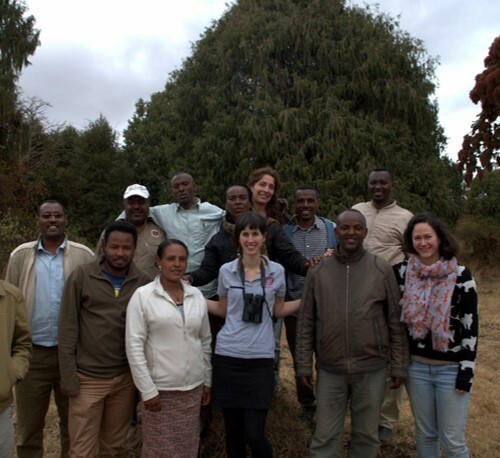 Fulfilling our pledge to help build capacity in Ethiopia’s environmental sector we supported the work of 10 researchers, mostly Ethiopian nationals, investigating topics of relevance for Afroalpine conservation. None of all these would have been possible without the generous support of all our donors, to whom we are grateful. When I started working in Bale in January 2014, Ethiopian wolf numbers were at their peak in three sub-populations monitored by EWCP for more than 20 years. Everybody was happy. I also remember, however, alarm bells ringing, with the certainty that wolves at high density are more vulnerable to disease infection - a pattern observed over and over. Sadly, our nightmare became true: at the end of the summer rabies spread rapidly among the wolves of the Sanetti Plateau and West Morebawa. 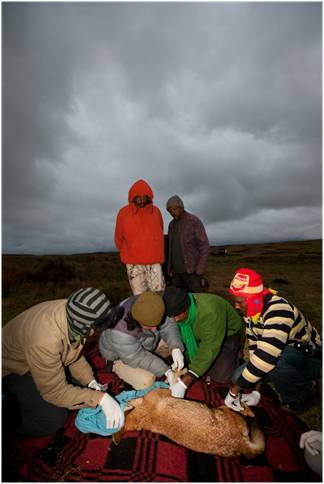 Rapid intervention to vaccinate 106 wolves, coordinated with the Bale Mountains National Park and the Ethiopian Wildlife Conservation Authority, helped to contain the outbreak. At the time we estimated that the affected populations had declined by a third, and thought that the worst was behind us, as we optimistically observed many packs producing pups and the population growing. In September 2015, however, the finding of two wolf carcasses in the Web Valley marked the start of the most dramatic outbreaks of CDV recorded in Bale Mountains. The outbreak reached wolves in Web, East Morebawa and Sanetti, halving their numbers. It was with huge sadness that we recorded the death of many wolves which, few months ago, we had vaccinated against rabies. Towards the end of the outbreak, permission was given to vaccinate a limited numbers of wolves against CDV, as part of an ongoing trial to test the efficacy of the vaccine on Ethiopian wolves. The results were promising. And the field teams report that an important number of pups are still alive, bringing hopes for a brighter future for the wolves of Bale. In the Bale Mountains, September marks the onset of the wolf breeding season. After a frantic mating period, finely synchronized within each subpopulation, this is the time when wolf monitors look for signs of denning behaviour and pregnancies. This time round their schedule changed dramatically. On 30th September, our guards in Web Valley camp alerted us of a young wolf that had died the previous night. Three days later another carcass was found nearby. Our team conducted detailed post-mortem examinations and collected samples, and by early October the Animal and Plant Health Agency in the UK confirmed canine distemper virus (CDV) as the cause of these two deaths. From the first death to March we found 34 wolf carcasses, including eight tagged animals, and 17 young wolves born on the previous breeding season. All 14 carcasses that could be sampled and tested were positive for CDV (and negative for rabies), and the timing and location of the deaths gave us some light into the transmission path (see map). The first casualties were detected in Web Valley (where the disease persisted for nearly three months) and the carcasses found in East Morabawa were from wolves that died around the same time. While it was unclear how the virus reached the Sanetti Plateau three months later (possibly via the Central Peaks) this was the outcome that we had feared the most: after the recent rabies outbreak, any additional mortality could have dramatic consequences for this population. The field team found the last wolf carcass on 23th March, when the epizootic was clearly dying out. Coming to terms with the impact of the last die off: How many wolves are left in Bale? 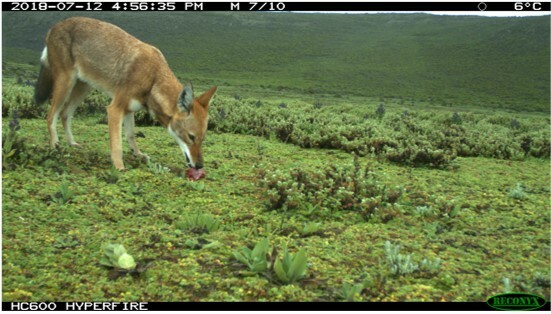 EWCP has monitored Ethiopian wolves in the Bale Mountains since 1987 and, as result, this is one of the best known populations of any threatened carnivore in the world. Following standard protocols, and after investing many hours observing selected packs (over 2,380 hours of observations by seven monitors in the last 12 months), we get to know the composition of some 20 focal packs in three core populations extremely well. By calculating annual changes in the size of these populations, we build time series that help us visualize long-term trends (see time line ). We also follow other 30 peripheral packs in Bale, at lower intensity. Our monitoring work this year was marked by a devastating outbreak of canine distemper virus (CDV). In the last six months we found 34 wolf carcasses, and an additional 31 adult wolves were unaccounted for in 17 wolf packs from Web, Sanetti and East Morabawa. This mortality represents an average decline of 52% of the adult wolf population across these three sub-populations, in comparison with the number of wolves present in the previous breeding season. Towards the end of the outbreak in March there were 23 pups alive in eight of our focal packs. This population decline is comparable to that recorded during the CDV outbreaks of 2005 and 2010. In the aftermath of the die off we estimate that there are currently 130 adult wolves in the Bale Mountains (not including the pups born this year). This is about half of a population of 250-300 wolves that would live in Bale in normal circumstances (i.e., carrying capacity). Whilst wolf numbers have eventually recovered from similarly severe outbreaks in the past, the wolf population in Bale is currently fragile -any additional mortality at this time could have disproportionate consequences. In order to avoid new epizootics, preventive vaccination of wolves is an urgent priority. We are currently working with the Ethiopian authorities on an integrated disease management plan for Ethiopian wolves to that effect. EWCP intervened quickly to avoid widespread mortality among Ethiopian wolves in Bale, thanks to the early detection of infected wolves. 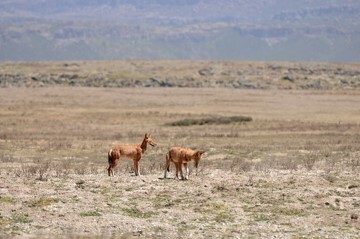 As soon as rabies was confirmed in brain samples from the carcasses found in Sanetti Plateau (by the EPHI and APHA laboratories in Ethiopia and the United Kingdom respectively), an action plan with immediate actions to tackle the outbreak was developed and authorized by the Ethiopian Wolf Conservation Authority (EWCA). The plan followed policy and routine methodologies identified in the Bale Mountains National Park (BMNP) Management Plan and the National Action Plan for Ethiopian Wolf Conservation. The most immediate response was the vaccination of wolves around the infected packs, using 2ml of Merck’s Nobivac Rabies vaccine. Vaccination started on 11 August 2014 with an Emergency Response Team composed by EWCP staff (capture and logistic teams), EWCA (veterinarian) and BMNP (expert and scouts), under the coordination of Claudio Sillero (EWCP Director), Eric Bedin (EWCP Coordinator) and Fekede Regassa (EWCA Veterinary Officer). After a first wave of infection in the Sanetti Plateau, rabies was confirmed in samples from the Morabawa population, and the vaccination team followed promptly. Wolves were also vaccinated in the Web Valley, to safeguard this important population. For the last vaccination campaign in the Web Valley in early March, EWCA authorized Leta Edea (EWCP vet) to be in charge of the vaccination, recognising the professionalism of the EWCP team. In total one hundred and six wolves were vaccinated in Bale between August 2014 and March 2015, representing roughly a third of the Bale population. As no pack went extinct as a result of the outbreak, and breeding success was good, the Sanetti population may be already in the way to recover. We are grateful to WCN and the Born Free Foundation that were able to step in and raise emergency funds for the vaccination operation at very short notice. Additional emergency funding was provided by the Zoological Society of London, the Critical Ecosystem Partnership Fund, Lobelia Press, Zoological Society for the Conservation of Species and Populations (ZGAP), John Stuelpnager, Houston Zoo, Saint Louis Zoo, Jan Richardson, Meryt and Peter Harding, the French Association of Zoo Vets (AFVPZ) Dakota Zoo Conservation Fund, and many others. We were able to start vaccinating quickly thanks to the generous and efficient support of the logistic teams of Merck MsD Animal Health (Rabivac IM vaccine) and Virbac (SAG2 oral vaccine). All biological samples were analysed by the Ethiopian Public Health Institute in Addis Ababa and the Animal and Plant Health Agency in the UK. The uncontrolled extraction of ‘charranfe’ bushes, dominant Afroalpine vegetation north of the Rift Valley, is degrading wolf habitat in several populations. Firewood collection, a task mostly performed by women and children, is as a result becoming more time consuming, increasingly occupying time available for other activities. 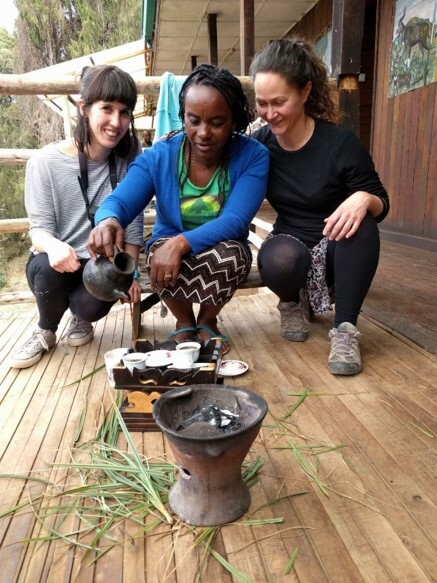 It was with great excitement that last year we announced our ‘Fuel Saving Initiative’ to promote the use of MIRT® stoves, which consume half of the firewood required by traditional cooking methods.These stoves also cook faster, and reduce indoor air pollution. Thanks to our efforts and with the support of GIZ (German Corporation for International Cooperation), these fuel-saving stoves are now being produced locally in two wolf areas. This followed a long process that involved choosing and training the producers, and the complex logistics involved in setting up their workshops. These entrepreneurs started to trade the stoves, and are targeting consumers on the fringes of the wolf areas. Simultaneously, EWCP is advertising the benefits of fuel-saving stoves in many local markets and schools with practical demonstrations, and organizing a system of subsidies to support buyers in target areas. After a very successful year, EWCP secured a grant extension from the Critical Ecosystem Partnership Foundation to help more stove producers start up their businesses. The monitoring team found the first Ethiopian wolf carcass in the Sanetti Plateau in July 2015, within the range of the BBC pack –which we started monitoring 20 years ago. Monitoring intensified and in August we found two dead juveniles in nearby Garba Gurracha pack, which finally testified to the beginning of a rabies outbreak, kick-starting the emergency vaccination intervention that followed. Carcasses were found in and around Sanetti until mid-October 2014, signalling the end of a first wave of infection. In January 2015 dead wolves started appearing in Morabawa, another core area for Ethiopian wolves in Bale. The sequencing in the lab of the rabies virus found in the retrieved carcasses showed that this was indeed a separated rabies ingression into the wolf population. While the vaccination team moved to Morabawa, three juvenile wolves were found dead in Sanetti as late as March 2015. No further carcasses were found since then. In total, between July 2014 and March 2015 we found 22 wolf carcasses (eight of which tested positive for rabies; others were too decomposed to provide suitable samples), and observed six sick animals, effectively signalling this as the most strenuous and hectic year in the life of EWCP. None of the dead or sick animals had been previously vaccinated against rabies. Can you see the wolf? ... No I can’t, where is it? Far in the horizon was the answer. This dialogue took place when Claudio and I were looking for wolves in the Guassa Plateau in 1995. I was amazed how someone could spot an animal so far away just by the slightest movement it was making, and even know what the species was. The love and intimacy that has grown between the wolves and a man and the resulting conservation actions now span twenty years. The Ethiopian Wolf Conservation Programme (EWCP) was set up to protect the Ethiopian wolf from extinction. Fewer than 500 individuals live in highly human-dominated landscapes, with the safest strongholds in Bale and Simien Mountains. From its inception in the 1980s EWCP has focused in the conservation of the unique Afroalpine habitat by using the wolf as a flagship. 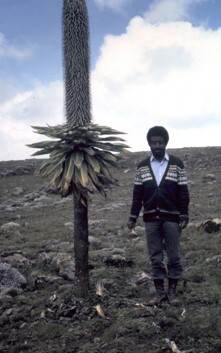 In the early 1990s it was the only field conservation initiative in Ethiopia, managing through a difficult period when other projects were discontinued. 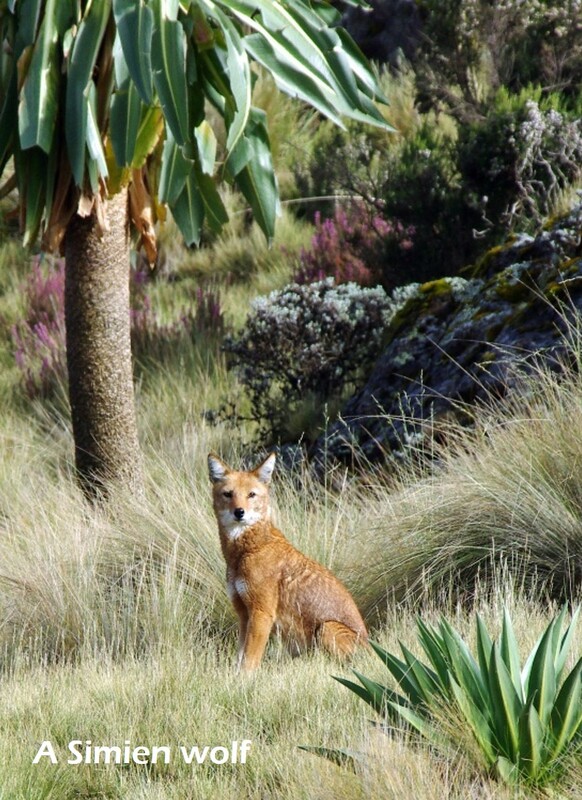 EWCP’s contribution is not limited to the protection of the Ethiopian wolf. Unlike other conservation projects EWCP has contributed to training and building Ethiopians capacity in the field of conservations biology, a profession which is sadly neglected. I would go as far as saying that more PhD and MSc studies have been carried out on Ethiopian wolves than on any other Ethiopian endemic, and this was possible by the support and supervision provided by Claudio and EWCP. I include myself as a pioneer beneficiary, initially as a collaborator, then as a graduate student and later working for EWCP and as Frankfurt Zoological Society country representative (EWCP’s longest serving NGO partner). EWCP’s ecological monitoring and environmental education components are the longest running such activities in the country, and other similar conservation projects are learning from EWCP’s experience. 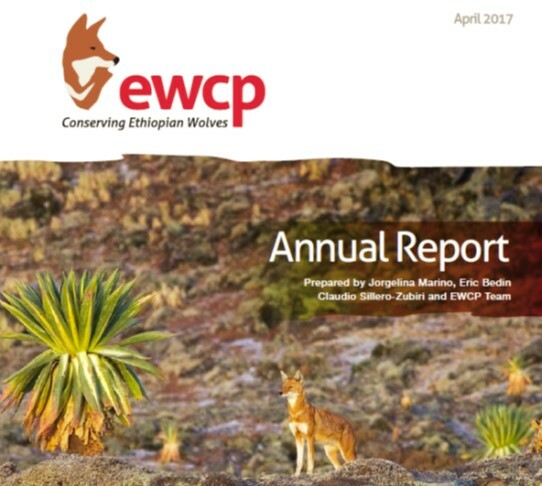 In a nutshell, I would say that in the last 20 years EWCP has contributed tremendously to our understanding of species and biodiversity conservation in Ethiopia, and we are grateful for those who founded the programme, working tirelessly in difficult conditions to save one of our nation’s unique flagship endemics, the majestic Ethiopian wolf. Since the first wolf carcass was found in Bale in July 2014, EWCP has worked frantically to contain the spread of rabies and to minimize its awful impacts. In Ethiopia field teams lead by Eric Bedin (EWCP Field Coordinator) implemented four intensive wolf vaccination campaigns, and many domestic dogs were vaccinated in surrounding villages. In the UK and abroad, I contacted our loyal supporters to appeal for extra help to implement the emergency intervention. We are grateful to all the individuals and organizations that contributed financially and to everyone in the EWCP family for their hard work. The intervention was the most intensive in the history of EWCP, reaching 21 wolf packs and protecting 106 wolves, around a third of the whole Bale population. In the Sanetti plateau, a prime wolf area and the epicenter of the outbreak, more than half of all the wolves are now vaccinated. The analyses of demographic data will give us soon a better idea of the overall mortality, but as far as we know, no wolf family has gone extinct during this epizootic. This is a great achievement, supported by the targeted vaccination strategy, aimed at protecting the dominant pair in each pack, thus ensuring social stability and succesful breeding. We will bring you news of this year’s breeding very soon. On the 23th of January, three months after the last wolf carcass was found, EWCP Monitors discovered a new casualty. The new death had occurred 7 months later, and 35 km west of the index case –the first wolf to die of rabies. The revelation that the outbreak reached the Morabawa population prompted the Emergency Response Team to re-group. On the 4th of February the team captured and vaccinated the first wolf -an adult female from the Weshema pack. After 10 days of sleepless nights, 25 wolves were vaccinated against rabies in 7 wolf families in the Morabawa popualtion (Fulbana, Wesema, Waota, Leliso, Gurati, Duna and Huke). Since the first wolf carcass tested positive for rabies in late July 2014, the Emergency Response Team, organized by EWCP with the Ethiopian Wildlife Conservation Authority and the Bale Mountains National Park, has been working relentlessly. In August 2014 the team vaccinated 44 wolves from 7 packs in the Sanetti plateau, the centre of the epizootic. As a result, more than half of all the Sanetti wolves are now protected. In September and October 2014, the vaccination expanded to Web Valley and East Morabawa in order to protect these core populations from an eventual infection through habitat corridors connecting them with the Sanetti plateau (20 animals vaccinated in 5 packs, adding to the protection delivered during the previous oral vaccine trails). The last carcass, found in October the 20th, was that of an adult female living west of the Sanetti epicentre, with estimated time of death of late September. No more carcasses have been found since then. A few weeks ago, our greatest fear was realized when a dead wolf tested positive for the disease. Since then there have been another six confirmed deaths. Immediately we sought permission from the Ethiopian Wildlife Conservation Authority to intervene and set up an Emergency Response Team with the Bale Mountains National Park. We have been busy battling wet and blustery weather at 4,100 meters to capture and vaccinate the wolves of Sanetti Plateau. We need your help to fund this intervention and stop this outbreak in its tracks, but also to vaccinate domestic dogs in nearby villages and monitor the wolves' health throughout the next year. You can donate via Paypal, WCN (USA) or Born Free Foundation (UK). Please use the Donate links below. Lobelia Press has generously offered to donate to the emergency efforts 100% of proceeds from any copies of Lobelia Press's award-winning The Ethiopian Wolf: Hope at the Edge of Extinction purchased from the official website. 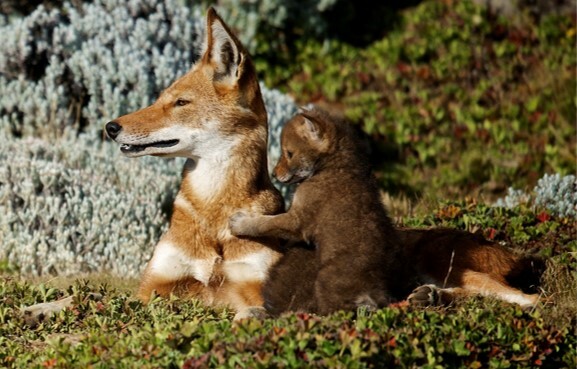 I hope together we can give the Ethiopian wolves a future. The wolves and the EWCP Team will be grateful for any support you may provide.